Lee Tomlin (right) celebrates Posh's 2011 League One play-off final win at Old Trafford. I have not been this excited about a Peterborough United signing since two-time England international Freddie Hill pitched up at London Road in 1973. Midfield playmaker Hill was always going to be too good for Division Four and so it proved. He remains the best free-kick taker I’ve ever seen in a Posh shirt and how Noel Cantwell persuaded him to come and play for a team that had struggled for a lot of the previous season is beyond me. Freddie Hill was a top Posh talent. And, providing Lee Tomlin is anywhere near his best form he is capable of having a similar impact in League One. Tomlin, for most his Posh career until Celtic came calling, was a crowd-delighting genius. He has abnormal vision (in a good way) for a League One playmaker and a superb passing range. He can score all sorts of goals. It could be the signing that secures Posh a place in the League One play-offs, or better. Let’s hope so. 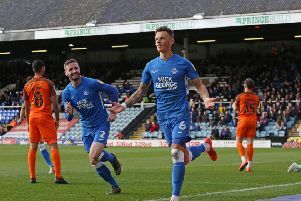 Posh chairman Darragh MacAnthony, director of football Barry Fry and manager Steve Evans have worked hard to get the most gifted Posh player of the last decade back to the club. Darragh MacAnthony (left and Grant McCann have both enjoyed working with Lee Tomlin. So why do I have nagging doubts about the likely success of Tomlin’s return? After all Tomlin is Championship class. When a manager like Bournemouth’s Eddie Howe is willing to pay millions for his services there can be no doubting the player’s quality. In the second-half of last season Tomlin lit up the second tier during a loan spell at Nottingham Forest, but there is work to be done to get him firing for Posh. There will be strong pressure on manager Steve Evans to accommodate his 22nd signing since the end of May in a way that benefits the team. That will mean abandoning the favoured 4-4-2 system, even for home games. Tomlin can’t be pushed right up front with his back to goal. Getting him to head a ball or chase it into channels would be like asking Lionel Messi to play left-back. It wouldn’t be the best use of his ability. Tomlin also can’t play wide in an Evans team as asking him to track back relentlessly like Joe Ward is again wasting his talent and box-to-box midfield work is best left to runners rather than an artist like Tomlin. Could Tomlin play off Ivan Toney? I’m not sure Toney would be as successful as natural speedster Craig Mackail-Smith in taking advantage of Tomlin’s clever passing. It’s a conundrum for sure and solving it would be a season-defining (and career-defining as far as Posh is concerned) moment for Evans and his coaching team. Solving it would ensure Posh finish in the top six and maybe even challenge for the top two. Too ambitious? Not really Marcus Maddison and Siriki Dembele should enjoy, and benefit from, Tomlin’s ability. There were signs that would happen at Stamford Bridge last night. All Posh need to do now is turn Alex Woodyard into Grant McCann and ensure Tomlin receives enough possession to wreak havoc.